6 sub posters will be exclusive to the sub. 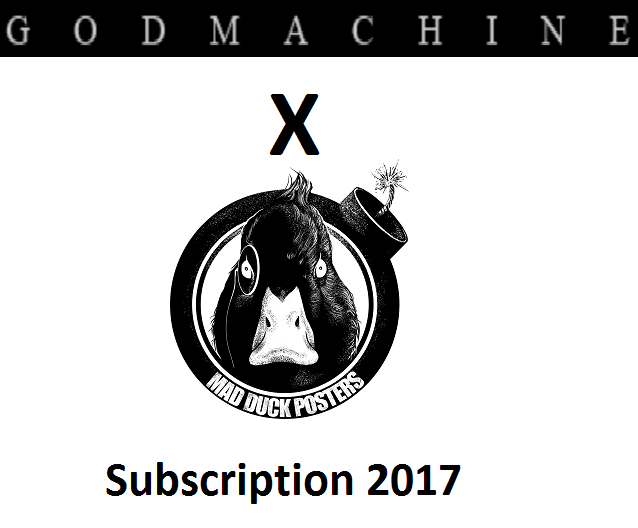 They will not be sold through the Mad Duck Posters store individually, and the sub is the ONLY way to get them! 4 sub posters will also have release day drops through the Mad Duck Posters store. Customers will be charged monthly for the sub, for a total of 10 months out of the year. 3 of the monthly sub spots will be decided by subscriber vote! There are two “tiers” to the sub. One tier will cover the regular monthly print. The second tier will also include variants. Here is the full breakdown on the tiers. • Cost will be $40 per poster (regular edition), charged monthly. • Subscribers will have the opportunity to vote on the subject matter for 3 of the projects slated to be part of the sub! • Opportunity to purchase extra prints at club prices. • Cost will be $75 for a matching numbered set of the regular and variant version of the monthly poster. The sub is available for purchase right now! Open Enrollment for the sub will last until January 6th, 2017, or until all club spots have been taken, whichever comes first! The first poster of the sub is “The Exorcist” and will ship to sub holders in January! • PLEASE NOTE – The subscription is set up for monthly shipping, however I am willing to combine shipping for up to 3 poster releases to help subscribers save money on shipping! Simply drop me a note if you want to do combined shipping with your sub!